Hello. I’m a little late, this time because I had to wait for enough functioning brain cells to gather in one mass. 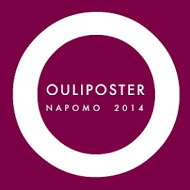 Today, I want us to oulipo [Didn’t know it was a verb, did you? During my month long romp with oulipian forms during National Poetry Month, several of us delighted in using the word oulipo in every way we could.]. ‘Founded in 1960 by French mathematician Francois de Lionnais and writer Raymond Queneau, Ouvroir de Litterature Potentielle (OULIPO), or Workshop of Potential Literature, investigates the possibilities of verse written under a system of structural constraints’. Several of you have played with a couple of the more well-known forms, such as the Snowball and N+7. If you know and like an Oulipo form, feel free to go with that, but if you want to hurl yourself into the unknown, I’m giving you the link to April. That gets you to April 30 and you can scroll back through the month looking at each prompt. For once, you will even have an example poem. Oulipo is a type of found poetry. My source, during April, was the newspaper. You may use any written material you wish. Some of the forms lend themselves better to specific types of writing. You will need to play. You may also need to adapt. For those who don’t have time to scroll through thirty days [! ], I am giving you links to my favourites and you can choose from among those — or do more than one. It’s addictive. 1] Lipogram: Not easy, but great fun. Ended up one of my favourites and one I remember. 2] Definitional: This was the first where I strayed from the prompt and redefined the form for myself. 3] Univocalism: Fun. I liked this constraint. 4] Never thought I’d be saying this — Sonnet: I went from despair to euphoria on this one. I chose the ultra-modern form, once I knew it existed and loved writing the poem. You can try this, or one of the classic sonnet forms. 5] And, the Irrational Sonnet: Much more sonnet like but with stanza breaks that I found work better for me, than the traditional. I thoroughly enjoyed working this. 6] Lescurean Permutations: This one tickled me, possibly because I had good source material. When you visit April, you will find the prompts, a brief comment or two, and my poem in response. All words are from another source. People approach the source material differently. Some cherry pick words, but that doesn’t work for me. I collect phrases and sometimes split them, if they are long. Of course, remove words that don’t work; change tenses and point of view and gender, for consistency; and place line breaks where the poem needs them. PLAY. I shall see you next Tuesday, not for the postponed prompt on sleeping/dreaming poets [I like the collection I have sitting on my other computer, so that’s waiting until post-summer, now.] Tuesday will be an unknown. Well, yes, I know. P.S. Check Wikipedia for some history, if you wish. Sound daunting? I thought so, but what it is, is an insistence on thinking creatively, something I tell myself I can’t do well, therefore why try. Being part of a challenge, I have to try and after the initial cries of despair with this prompt, I had a ball. My source newspapers are the San Francisco Chronicle or the Wall Street Journal depending where I am. The first leaves me with the vowel ‘u,’ the second with the vowel ‘i’. I decided to stick with the Chronicle and took my words from the comics, the crossword, and the horoscope.